When God so graciously gives to us, the blessings should not stop but flow outward to touch others with His goodness. We've chosen two groups to donate a percentage of our profits. Clean the World recycles soap and saves lives! Impoverished people around the world die every day from acute respiratory infection and diarrheal disease because they have no soap. The death toll is staggering. Each year more than five million lives are lost to these diseases with the majority of deaths being among children less than five years old. Studies have shown that simple hand washing substantially reduces the spread of these diseases. Unfortunately, the essential items for proper hand washing are unobtainable for millions of people worldwide. Rose of Sharon Acres recycles all of our scrap soaps and sends them on to this wonderful organization that has been a front line supporter of the Haiti devistation. 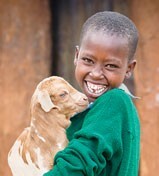 Give a Goat - Save a child's life with milk, cheese and much more! A healthy dairy goat can give up to 16 cups of milk a day. Goat milk is easier to digest than cow's milk and is an excellent source of calcium, protein, and other essential nutrients that growing children need. Goats are practical animals ? flourishing in harsh climates while producing valuable manure to fertilize crops and vegetable gardens. Rose of Sharon Acres will contribute a portion of their profits to help people in Africa. We pray that God would 'bless the work of their hands'.